While rack collapse may be rare, it is extremely dangerous. Here are some ways to make sure it doesn't happen to you. It might be tempting to think of the racking system in your warehouse or DC as a larger version of the metal shelving in your garage. After all, how complicated could a steel rack be—especially the traditional selective rack, which doesn't even have any moving parts? Such thinking, however, could lead to a costly—and potentially deadly—disaster. "Storage racks are a load-bearing steel structure, and because they're supporting a variety of different loads, it's important for them to be maintained," says Dave Olson, national sales and marketing manager for the manufacturer Ridg-U-Rak. Rack damage can lead to collapse, he continues, putting your equipment, people, and even financial health at risk. 1. Choose your rack with care. There are many different types of racks on the market, from selective rack to high-density drive-in rack to carton flow rack, as well as many different components for each type of rack. If you select the wrong type of rack for your operation, you're more likely to experience rack damage, according to Olson. "A proper analysis and design is required to ensure the storage system provided will meet all of the requirements," he says. As for what factors to consider, Domenick Iellimo, executive vice president of sales for the storage system manufacturer Frazier Industrial Co., says rack designs should take into account three things: product/unit, handling method, and area. As for the first of these factors—the products being stored on the rack—it's not enough to simply look at the items' weight and dimensions and how the loads are configured and distributed on the rack, Iellimo warns. You also have to take into account how fast your product turns. For example, a produce warehouse that has a high inventory turn rate will require a heavier-weight or more durable racking system than a warehouse with a lower turn rate. That's because the added activity increases the risk of rack damage. Similarly, the design should take into account the material handling method being used. "What sometimes happens is that companies are very focused on the unit being stored, and there is not enough focus right up front on the interface between the material handling equipment being used and the rack," Iellimo says. When this happens, Iellimo warns, you risk designing a rack system with aisles or shelf clearances that are too tight to accommodate the facilities' forklift trucks or other vehicles. In addition to the considerations mentioned above, it's important to make sure the rack meets the seismic requirements of the area it is located in. 2. Don't adjust racks without consulting a qualified expert. It's true that a rack is made of many different components—such as frames and beams and footplates—that are put together like a giant Erector set. But once those parts have been assembled and installed in a warehouse or DC, it is crucial that you continue to use the rack as it was originally designed. "It is so important to think of a rack as a system," says Steve Rogers, a vice president with the storage system company Hannibal Industries. Racking systems are now considered a building element and as such, have to conform to very strict codes. That means you should give the same thought and consideration to, say, removing or altering a beam as you would to removing a wall or column in your distribution center. 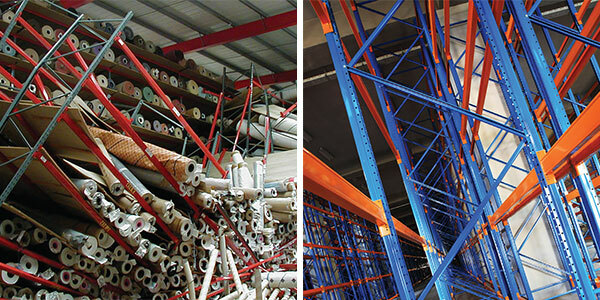 "Any adjustment to the beam level affects the carrying capacity of the frame and [could potentially] lead to collapse," says Greeba Rampaul-Essue, president of Storage Equipment Safety Service, a company that conducts rack inspections and training. That is to say, if a beam is raised, lowered, or removed, the rack may no longer be capable of bearing the amount of weight it was designed to handle. Similarly, Rampaul-Essue urges users to be careful when mixing together components from different manufacturers. "One of the key things about a rack is the safety lock that holds the beam in place; if that safety lock is not properly engaged, then your beam is not properly held in place and can be easily dislodged," she explains. "If you're mixing components, you need to make sure that the beam from one manufacturer and the frame from another manufacturer fit together." 3. Don't overload your racks. Loading more product onto a rack than it's designed to handle could damage the structure and eventually lead to failure. According to the RMI and the American National Standards Institute (ANSI), all racks should display a plaque showing the rated load capacity of the pallet rack or the maximum weight it can carry. DC managers should be particularly careful when they change the types of products stored on their racks or even the type of pallets they use, as these changes could lead to overloading, warns Rogers. 4. Train your employees in rack safety. "If you were to put in a rack system, load it up, go home, and never use it, the rack would stand forever," says Raymond Weber, Eastern regional manager at rack maker Steel King. "However, as soon as your forklift trucks start moving pallets in and out and bumping into the rack, you are creating more load in rack than the structure was initially designed for." Rampaul-Essue recommends conducting awareness training with employees who work in the rack system to ensure they are using it properly and are mindful of the load tolerances. The training should include how to report any damage to the rack and emphasize how important such reports are. Properly training forklift drivers is particularly important, as the majority of rack damage is caused by forklifts hitting or bumping the structure. In tandem with that training, Weber recommends making sure your incentive programs for forklift drivers are reasonable so that they're not rushing to hit their numbers, making accidents more likely. In addition, warehouse supervisors and/or safety staff should be trained on how to conduct a proper rack inspection, says Rampaul-Essue. 5. Conduct periodic rack inspections. MHI and other industry bodies recommend having an external party inspect a distribution center's racking at least annually. This external party could be the rack manufacturer or someone from a third-party inspection company. Rampaul-Essue takes it a step further. In addition to the external inspections, she suggests that facilities conduct internal inspections for rack misuse or damage on a monthly or even weekly basis. Inspectors should look not only for damage but also for misuse such as overloading. 6. Install "protective guarding" devices. There are many types of safety equipment that can be installed to protect the rack. Guarding and post protectors can keep forklifts from directly hitting the rack. You can also reinforce the rack by putting in double columns at the base. Be careful when installing protective barriers, however, as some of them can reduce aisle widths, says Rampaul-Essue. Make sure that your forklift trucks will still have room to maneuver when the barriers are in place. 7. When a rack is damaged, have it checked out by a rack expert immediately. The RMI says that all damaged racks must be repaired or replaced. "Once a rack is damaged, it may continue to stand, but that doesn't mean that it's safe," warns Weber. Rampaul-Essue agrees, noting that rack may stand for years before one slight bump sends the whole thing tumbling down. Many manufacturers will allow you to send them photos of the damage and will then recommend the best course of action or come out to repair or replace the rack. But rack owners shouldn't be surprised if repair isn't one of the options offered. Some manufacturers are wary of repair kits, unsure of how they will perform in concert with their racking system. According to Weber of Steel King, there are currently no industry-specified guidelines or policies for rack repair beyond the suggestion by RMI that all repairs be overseen by a rack expert or professional engineer. "Because of that, Steel King takes the stance that any rack that is damaged must be replaced," he says. No matter what type of rack alteration you're contemplating—repairing, replacing, moving, or simply adjusting a rack—experts agree that it is crucial to consult with a rack expert. But who should that be? Some advise always using a professional engineer. Others say simply hiring a professional engineer isn't enough—what you need is a specialist, someone who is an expert in the type of racking you use. "It's similar to how you think about doctors," says Rogers. "If you're dealing with a 10-foot selective rack, there are a lot of people out there who can help you. But if you have a 36-foot-tall dynamic storage system in a high seismic zone, then you are going to need the equivalent of a brain surgeon."